It was such a pleasure to work with you right from the word go. You were everywhere, capturing every moment without being intrusive. Having you around was like having a friend at our wedding which put us completely at ease. A result of this is the lovely pre-wedding shoot that we had. The pictures have portrayed every aspect of our relationship so beautifully. Couldn't thank you enough for taking such a personal interest in our wedding and making sure the photos turn out just Perfect!! Looking forward to working with you again and wishing you all the very Best. " "During the wedding, you were always around at the right moments, friendly with guests and family members and accommodated any requests we had. You’re an absolutely amazing person and photographer. Bangalore was an away wedding destination as our parents are from Pune/Hyderabad and we live in Michigan. You were responsive and was always available to answer any question we had regarding your photography services. We also hired a 'traditional' photo/video services from the contact you recommended and they turned out per expectations too. By the end, during the photoshoot and following Skype conversations for album design, it felt like we were working with a friend than a hired professional. The level of comfort, professionalism, photography and 'story - telling' skills were beyond exceptional and I would totally recommend you to anyone looking around for photo services. All of the pictures were absolutely gorgeous and we would definitely hire you for another family event again! " "Efi & I were extremely lucky to find Manas as our wedding photographer for our Indian wedding in Bangalore at the ISKCON Temple. We were initially attracted by his style of photography which had a unique essence of portraying emotions. We instantly saw that he was a story teller and thats exactly what we wanted with mine and Efi's different cultural backgrounds (Indian & Greek based in the UK). Throughout the process he was professional, punctual, polite and very approachable. At the end of our journey he became our friend. We were extremely happy with the experience Manas provided us and importantly his photos were amazing and exactly if not better than what we had expected! One would be missing out not having the fortune of Manas's services. Great job buddy and thanks again." "Manas is the definition of candid photographer. He was always present at the right moments and no one ever realised they were being captured. We are particularly wary of posing and Manas kept his promise and never asked us to shine on a smile for him and we were absolutely comfortable throughout. He was very generously accommodating with the tiring schedules of the wedding too. The result was a set of genuinely beautiful, sometimes funny, sometimes emotional photographs which take you back to those amazing moments each time you see them. Thanks, Manas! We will keep in touch and our paths will cross again for sure :)"
"My son’s wedding was to be held in Chennai in the first week of December 2015. That was the time when the rain started in Chennai. It poured for minutes, hours and days. The entire city was flooded. By the joint effort of our family members, the marriage was shifted in two days to our native place, Gobichettipalayam. By God’s grace, the wedding took place in such a grand manner. The stage arrangements, the garlands, the lightings, the attire, the jewellery and everything added beauty to the bride and the groom. The old and the young, everybody enjoyed. Here, I would like to make a special mention about the person who captured all our emotions and our precious moments so beautifully. It is none other than our photographer Neetika Gupta. Though the wedding was in a place which she had not even visited once, she agreed to shoot for the wedding. We were overjoyed to hear that she could make it to the new venue at such a short notice. She got adjusted to the atmosphere so well, that she became one in our family. Her photography was not just about covering all the wedding ceremonies but it was a reflection of our deepest emotions. She made our wedding more special with her innovative photoshoot at our farm. She and her team stayed in our village for two days and made my son’s wedding a memorable one. The following week, we were happy to have our favourite candid photographer back for the reception at Bangalore. Thank you Neetika, for your wonderful cooperation and your beautiful work which makes us relive our memories." "From out first conversation on the phone to the present conversations, we have enjoyed every interaction with you. Thanks for being so flexible when we had to change the venue for the photo shoot. Everyone looks fantastic in the pictures and you have captured most of the unexpected moments which will be treasured for our lifetime. We loved that the photos did not look staged, fake or cliché. All the photos very well captured the beauty of our location, excitement among everyone and the romance of the wedding day in a very special way. Thanks for the wonderful photos and a really cool album :)"
"Manas is great at what he does, and his work is among the few out there that can actually be called candid wedding photography in its true sense! He comes across as genuine and chilled out, yet very professional. When we reached out to him initially, we were unsure of what we needed, since our wedding was a very haphazard affair with everything just coming together without a lot of planning, but we still wanted something to remember the day. At this point, Manas was very accommodating and worked with us from the start, sticking to his promises (even when we didn't remember what they were!). In the end what we got was so much more than what we expected, in terms of the wedding experience as well as the photos. The best thing that can be said about Manas, though, is that everything that you see at first, truly is what you get. It really is how he describes his work on the website - pictures that capture moments that successfully take you through the events of the day and help you connect the dots on things you may have missed out on the big day among the chaos. Thank you, Manas! For everything right from the day we got in touch, for being the invisible photographer on the wedding day, for working with our folks, for sticking to your promises and finally for the most awesome photographs!" "I love, love, love, LOVE the pictures! They have come out so well. You have really captured the key moments extremely well. And you have also succeeded in capturing the essence of the wedding which is all about the families. Thank you so so much! I must say that the outcome has really exceeded my expectations. You have done a tremendous job and you are really gifted with an eye to catch the right moments of an Indian wedding. Thank you so much. I knew I was making the right choice when I decided to work with you. I shared the pictures with my family and close friends. Some of the feedback I have been getting is - very well covered, the emotions are very well captured, some of Darshan's expressions captured during the mehendi/sangeet are priceless ( said by my mom especially), a job well done and totally worth the money that was spent. Everyone is very happy with the outcome. I am extremely happy with the way some of the best moments of my life will be preserved forever. I really can't thank you enough :) Again I am so glad I found you! " "We both want to say a HUUUGGEEE THHAANNKKK YYOOUUU!! The photos are much more than we were expecting! You captured the most amazing little moments between people and thats exactly what it was all about. I showed the story to a couple of people already and they cant stop looking at it over and over again. So many people have been telling us how amazing the photos have come out and how its captured the essence of the day. After all the ruckus, our wedding was more perfect than we could have ever imagined in so many ways. So many people came up to us and told us how much their thought processes and priorities about weddings have been shifted. The things we set out to do actually ended up being accomplished and you helped us capture all that. Whenever we look back at those pics, everyone talks about so many other things that actually matter instead of how beautiful the venue is, or how nice the clothes look or how decked up people are in gold..We were talking about how even though all the things around us were so simple and basic, you made them beautiful. And we were so right about the fact that if we had used any other photographer, it would have looked dingy and run down. But you brought out the beauty of even the simplest things that day. So, thank you thank you thank you so much!! We really appreciated the photos and are totally in love with them :-)"
"Manas was such a wonderful person to work with! Starting from my first email checking availability till the end of photo shoot and delivery of photos, there wasn't even one moment where we weren't happy with him or his work. We met for coffee to discuss what we were looking for before the wedding, and it felt like we were with a friend we had known for years! He is very personable! The entire day of our wedding he was very respectful of our space and of our schedule. He was on time, explained his style of work ahead of time, shot the wedding wihtout nearly being noticed. He also accommodated an extra little photo shoot that we wanted around Bangalore during the short time we were in town! He finished our pictures far ahead of schedule and they turned out beautifully; our family, friends, and we are very happy with the pictures. Samantha's family wasn't able to attend the marriage, so the pictures he captured were very precious to them to experience the day. I would highly recommend Manas to anyone seeking a wedding photographer! " I am a Hindu married to a Christian. Manas captured the cultural and traditional blends in our wedding beautifully.I am glad that Savio and I chose him as our wedding photographer. He is very professional and genuine at the same time. He took a sincere effort to know us before deciding to take up the assignment. The elderly members of the family adored him. And if you are the bride, rest assured that he will keep showering you with warm compliments. Savio and I wish Manas the very best in all his future assignments!" "Approximately one month after the marriage .. where the minute yet significant details of the ceremony , were slowly fading away , comes the mail carrying a tiny link to the pictures captured by Manas . And Aloha!! All of it comes rushing back, refreshing the wonderful moments, the moments which very conveniently escaped our attention, caught in the lens and preserved for a lifetime. Capturing the right freeze of the moment, where the dear ones in the picture , exchange unspoken emotions and feelings , just through the eye contact , is a gift that he pours into his photography . We are thankful to have come across Manas and very glad that we rightfully chose him for our special day. "We heard about Manas from our friend whose wedding he had shot. We were extremely impressed with his pictures. So we decided to contact him and check his availability and his desire of wanting to shoot the event. This is where the experience just got amazing. We spent about an hour skyping with him so that he could understand our relationship. It felt extremely personal as if a friend was trying understand us. This definitely set the tone. During the wedding Manas was pretty much like a friend and a family member. The photoshoot was so much of fun, that we could forget all the drama that exists in weddings. His eye for location and knowledge of photography is second to none. While shooting the wedding he did his work without disturbing anyone. It felt like he was just absent and we could do our own thing instead of posing (extremely professional!!!). Ours was a shorter telugu wedding and Manas understood that, and was more than happy to shoot pictures of just us at locations where we wanted. Oh yes there are memories from his images that make us remember of the fun times during the wedding, as well as what we missed. The pictures were delivered on time and were truly outstanding. Thank you Manas!" "I started preparing for my wedding a year ahead and one thing that I was absolutely clear of was my wedding photographs. I knew how I wanted them to be. Looked all over, tried to enquire with friends and acquaintances. But when my friend showed me your work I knew instantly that this is how my album should look. We so appreciate how you coordinated with us while we were still in Dubai. The one beautiful thing I like about your art is how you capture the act of the moment. I was observing one particular picture you took of the maruvedu where after the gifts were given people were busy guessing what was inside it. If it was not captured the way you did , it would have looked more like a bunch of people standing together. The North and South cultures are so beautifully captured and this one thing both Prakash and I wanted to come alive in every photograph. One more thing that I totally appreciate is how you became a part of the family. Just made me feel a bit relaxed because of all that was happening around me. I knew I will not be able to attend to you. Anyone who sees the pictures tells us that they relived the wedding all over again. That’s a compliment to us and to you. Parkash and I are extremely thankful to you for making our day such a beautiful and colorful memory. I hope we have been able to make you feel at home with us. We definitely want you to be more than just our wedding photographer." "We'd heard of Manas through a friend, and we decided to talk to him when we were looking for photographers for our wedding. We were comfortable with him from the start and he worked with us leading up to the wedding to make sure everything was on track and getting done. He was always available to answer any questions we had for him. During the functions themselves, he was everything we were hoping for. He captured the key moments beautifully. Equally important (for us, at least), he wasn't like the traditional wedding photographers who end up being the center of attention themselves. He was always there in the background without making a fuss or demanding that we stop doing what we were doing for a photo or that the lighting be adjusted for him etc. He got along well with our family and friends and everyone was quite comfortable having him around - another important consideration for us. All in all, we had a fabulous experience with Manas and would definitely recommend him to anyone looking for a classy wedding photographer!" Also, we LOVED the candid shots you took of Akshay and me soaking in the happiness (especially that hugging wala B&W pic) after we were back from the religious ceremony." "We want to Thank You for the wonderful job you did for us. I'm sure your passion will take you a long way & sooner than later we won't be surprised to hear people talk about you & we would proudly tell them , he is the one who did our wedding story. Thank you for making two people who are totally not comfortable with the camera look nothing like it and making those pictures look the best they can be." "Manas did a fabulous job capturing our wedding. The pictures capture the whole day so beautifully that we felt that we were watching a video. We will look at the pictures and they will take us back to cute moments on our special day forever.Thank you Manas. Well done. Very happy!" "A professional photographer with a personal touch!! His strength is to capture the emotion of the moment and not just the moment. In spite of having another photographer (the more traditional way of photography), we hired him and we are really glad that he is a part of our wedding." "We had an amazing experience from start to finish and Thank you so much for capturing the beautiful moments on the biggest day of our lives. 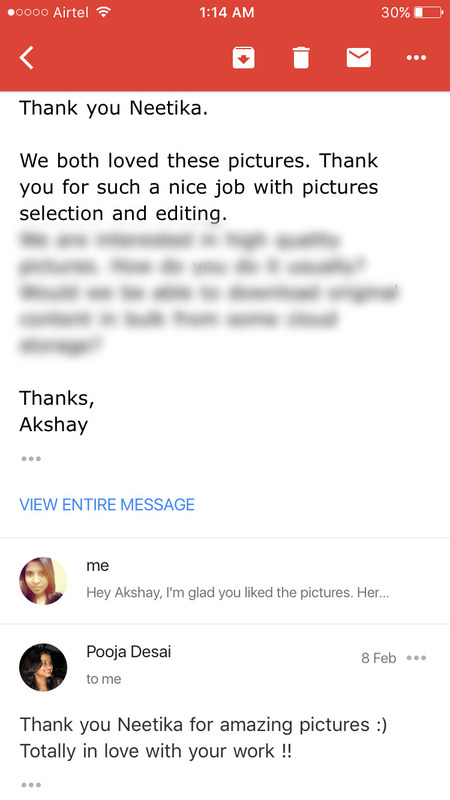 Raghu and I really appreciate your unobtrusive way and we really felt that you cared and listened! You definitely have an eye for photography, which only a very few professional photographers have. Every time I look through the pictures, it is just like my wedding day all over again. You have captured the happiness and emotions beautifully. Thank you more than words can say!" "Each and every picture has captured the true emotions and the fun we had during those three days at the wedding. All the pictures look stunning and truly brings out the essence of our relationship - Love, fun and whole lot of goofiness! These are moments we will cherish many years down the line and I want to thank you for capturing all those memories! Thank you so much for the lovely pictures!" "After a lot of research and deliberation about wedding photographers, we knew Manas would be the perfect choice for us. He was very prompt, succinct and considerate in our initial correspondences and based on our experiences with other photographers, this was a "make or break" kind of a phase but Manas just charmed us. He has been wonderful in his interactions and very accommodating to our requests. I will just end this review by saying that not a lot of people give you a sense of assurance about your choice but with Manas, the day we booked him, we felt we had nothing to worry about and we never had to." "We are thankful for all the wonderful work that was delivered. The pictures delivered had a very different perspective, capturing the key moments cherish-able for lifetime. You had created a comfortable feeling throughout working with you. Even though I lived overseas, all the efforts you took to set-up Skype calls while getting introduced, as well as working through the album run-through is well appreciated. Again, thanks for all the suggestions and good work." "We just loved working with Manas. Our wedding was covered exceptionally well !! Let me add a bit of history to this... When we started looking out for our wedding photographer we went through lot of guys out there in the market. Many one-one sessions. Manas was the Fifth guy we spoke with. Manas Online pictures appealed us a lot and specially his "who should hire you section". After having a conversation with him, we just clicked. Even though i had few more people in list to contact to, i knew i have made right decision and went ahead with Manas. Final outcome of our pictures were brilliant as expected. If you have any second thoughts on your mind for selecting Manas, just ignore them and go for him. I am sure few days later you will end up writing a review like this on his wall!" "Viraj and I were very lucky to find each other and equally lucky to find Manas to capture the most important day of our lives - our wedding day.It was a random Google search by my mother that led us to Manas. Since the day we met him, we knew that the responsibility of the lovely pictures was in safe hands. The pictures that Manas took truly captured the essence of the wedding and of Viraj and me. The minute I saw the pics, I could not wait to share them with every one I know. The gorgeous pictures set in an even more gorgeous album currently take center stage in my new marital home. I'm sure that over the years, these pictures will make it so easy to relive the fun and frolic of the most exciting days of my life." "The pictures are just gorgeous... It is everything I wanted in terms of my wedding album.. Everybody just loved it. It was really great to have you as a part of our celebrations. You were really nice to work with. It was a very good meeting of minds and am glad that the outcome reflects that. Thanks a bunch man! All the best for your future endeavors."